This quirky collection of literally 32 short sketches about bees (with that definition expanded to include “B”, Bea”, “Be”, and various references to buzzing) comes from a sketch supergroup with a little bit of Bad Dog (La Grande Jatte’s Andrew Bushell), some Second City (Leigh Cameron), all of Oops it’s Chris and Cam (Chris Leveille, Cameron Wyllie) and half of Dame Judy Dench (Leveille, Jessica Greco and Shannon Lahaie from the 2x MyTheatre Award-nominated Fringe favourites who’ve quickly become one of the most dependable troupes in town). Limitation can breed creativity and the confining concept of this surprisingly ambitious show does just that, forcing the group to find yet another then another new take on bees- their function, their endangered status, our reactions to them, and all their homonyms. Highlights include a riff on musical theatre choreography in Jesus Christ Superstar’s “What’s the Buzz”, Chris Leveille’s recurring Bea Arthur impression, and Leigh Cameron’s defiant attempt to insert a sketch about lizards (“it counts!” declares Jessica Greco). Shannon Lahaie appears periodically with a whiteboard update of how many sketches they’ve done, making us allies in the challenge they’ve set themselves. And it does feel like that- a challenge they’ve taken on together. 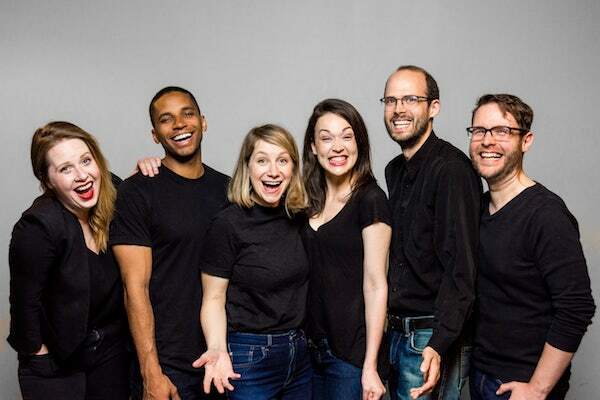 There’s a cohesion and chemistry on display here that is, for me, the mark of great sketch; they’re not each trying to be the funniest person on stage, they’re working as a team to present 32 short, eclectic, clever, consistently funny sketches about bees. Playwright Maureen Gualtieri’s tender period piece about a woman (Mattie Driscoll) and a man (Jesse Byiers) searching for the missing woman (Krystina Bojanowski) they both consider the love of their lives has a too-strange ending but is otherwise an excellently constructed and remarkably moving portrait of love in its many complexities. Driscoll is a grounded, relatable heroine but it’s Bojanowski as the soulmate she loses too quickly who really steals the show. Balancing the ethereal perfection of a character who exists entirely in the memory of those who loved her and the human fallibility of a strong, conflicted, frustrating young woman as she really was, Bojanowski makes the audience fall in love with her too. This sketch revue from refreshingly diverse (in age, gender and race) troupe Not Oasis is serviceable but mostly unremarkable. Jennifer Ashleigh Lloyd delivers a few hits with her take on a bored employee at the CN Tower EdgeWalk and as one of two video game avatars (with King Chiu) who’ve become proxies in a real couple’s argument, but little else is all that memorable with many sketches running too long (a bit about social media “helping”) or balanced on a flimsy premise (two couples literally fighting over the cheque). Norman Perrin isn’t a very natural performer but he brings such plainspoken earnestness to his folktale storytelling show that you want to listen to him anyway. With every story framed with a claim of it having happened to his grandfather or uncle, the show begins with the most theoretically plausible of the tales (fly training and ice fishing) and progresses steadily towards deals with the devil and music played with moonbeams. It’s not the strongest solo show, but it’s awfully sweet. One of quite a few post-apocalyptic plays at this year’s Fringe, Plague tells the story of a couple holed up in a bunker, paralyzed by fear of spreading sickness, unable to touch each other’s skin and regularly dousing themselves in disinfectant spray. The one moment when they are able to connect with each other is the only moment we’re really able to connect with them, the rest is cloaked in unknowable and ultimately not-that-important mythology. This tiring solo show is theoretically about a woman who finds an unconventional space (a busy traffic island) to work on her indie album. I think it’s supposed to be about the struggle of creation and finding inspiration in the mundane but it’s definitely actually about a homeless woman in need of some mental health support. If I felt like the creators knew it was about that, I’d be much more confident in recommending it.